SARATOGA SPRINGS - John Weber knew he was taking a risk. "To me, one of the great things about having a 'teaching museum' at the Tang is that you can experiment with things like this," he said. Still, the Tang's Dayton Director had no idea what to expect. Deliveries had been arriving by the truckload for weeks in preparation of the museum's mammoth new seven-month exhibition "And Therefore I Am." One of the most prominently visible displayable spaces had been purposely left vacant, slated to be filled at the last moment. For this, artist Matt Mullican was to come to Saratoga and fill the space with an original, on-the-spot creation - while under hypnosis. So last Monday the artist walked into the gallery, was met by a locally based hypnotherapist and promptly put under. Mullican picked up his black acrylic paints, turned to face the large blank wall, and for the next hour and 15 minutes the California-born artist drew while in a hypnotic trance. "I watched the whole thing. Through it all, as he's drawing, he's visibly shaking and making all kinds of odd noises," said Weber, offering that the artist's under-hypnosis work and wide-awake work are very different in style. Mullican's drawings probe the subconscious of "that other person" he becomes while under hypnosis. "It's very strange, and in a way makes us ask: what IS normal waking time?" Weber said. Mullican's is one of nine contemporary artists' works in "And Therefore I Am." The exhibition, opening this weekend, is an art-meets-neuroscience display rooted in conveying - and questioning - the nature of human consciousness. The exhibit seeks to get inside your head while taking you out of your own mind and goes deep in the heart of your brain, pulling levers and flipping switches along the journey. "What all these artists are getting at is, at times, disturbing," Weber said. "It is, at times creepy, and at other times, quite fun." In Janet Cardiff and George Bures Miller's audio-video installation, "The Paradise Institute," viewers sit in the balcony of an old-fashioned theater that combines inner monologues, binaural audio recording technology and a film-noir video installation. "The Paradise Institute" leaves viewers with the impression of being inside the narrator's head - or having the narrator inside yours, explains Weber, who first worked with the artists in the 1990s. "People talk about it as being inside somebody else's head. So I thought it would be interesting to take Janet's work and George's work and take that 'being inside someone's head' and revolve the show around that," said Weber, who came to the Tang a little over a year ago after more than a decade as curator of the San Francisco Museum of Modern Art. Other works on view include Sean Landers' language paintings, layering word-packed paintings in large block letters on top of each other. "Sean works with automatic writing and surrealism," explained Weber, pointing to a painting with words blotted over by other words. Instead of erasing the first ones, he wrote over them, so it all is there in the work, Weber pointed out. "He's publicly exposing himself on the one hand, while protecting people on the other. It's important to him that it's all there." Beth Campbell's sound-and-sculpture installation, "I Was Thinking" features an ordinary, interactive living room that broadcasts the artist's innermost thoughts out loud. The installation includes a clock, a radio and an answering machine. A sweater is haphazardly thrown on a foot rest and a four-stack shelf is lined with candles, a telephone and a plate with the name "Mike" finger-scrawled in chocolate swirls. Socks, boots, a self-help paperback and a copy of Cosmopolitan Magazine lie next to a fully usable couch that is aimed at a TV set as an eight-minute sound piece ushers in six different types of audio - Campbell's varied inner thoughts flowing from one skull. "We know a lot about the brain, but there's a whole lot more that we don't know," Weber said. "The works are about thought. We narrate our experiences in our own head all the time." Rather than create an interactive setting to simulate what goes on inside the skull, conceptual artist Jochem Hendricks sent in the brain itself - or, a reasonable facsimile of it, anyway. The computer-fabricated 3-D sculpture "Brain of the Artist" was created by the artist in collaboration with an MRI laboratory in Germany and is an exact replication of his brain. Weber said it embodies the mystery of the entire exhibition: "how a three-pound mass of organic tissue inside our skull creates the animated, endlessly puzzling and fascinating sense of human identity and consciousness we each experience." Shana Lutker documented her dreams through the entire calendar year of 2003, printed them on newsprint and created her installation, "Dream Newspaper." The exhibit looks like a library reading-room table whose reading material is entirely made up of her dreams. In another exhibit, early video-artist pioneer Peter Campus is represented in his 1978 piece, "Head of a Man with Death on His Mind." And one of the more intense exhibits is depicted in Douglas Gordon's installation "30 seconds text." It takes just that long to create the experience that links body and brain, life and death, and the persistence of consciousness. Weber first saw the piece eight years ago. It displays a brief wall text relating a gruesome experiment described in a 1905 archive of criminal anthropology. A special room was constructed at the Tang to house the piece. "It shows the boundaries between consciousness - and the lack of it," explains Weber about the exhibit that inspires more questions than answers, including the most important one. "It's also about death," Weber said, "and that is the final question." Inside the room it was dark and quiet and the doors were sealed tight. There was a cocoon-like feeling being inside the big wooden box that confused your sense of time, so when you eventually emerged you didn't know whether you had been inside for five minutes or five years. 'Welcome back,' announced John Weber when the experience was over. He stood smiling in the doorway, the light from outside flooding around the frame of his silhouette and into the darkened room. It was as if he was welcoming back a group of space pilgrims re-entering the universe. 'How long were we in here?' Weber was asked. The Dayton Director of the Tang Museum pawed his neatly trimmed salt-and-pepper beard. 'Thirteen minutes,' he replied. It seemed an extraordinary length of time. 'Did it feel much longer or much shorter?' Weber asked. The truth is that it seemed both. Simultaneously. The cause of all this wonderment is a large interactive exhibit called 'The Paradise Institute,' an audio-video installation created by the artistic duo Janet Cardiff and George Bures Miller. Weber secured it from the Corcoran Gallery in Washington, D.C., for the new exhibition of which he is the curator at The Tang Museum at Skidmore College. It was brought north in two semi-trucks and once unloaded, took six people six days to put together. If The Who had their Magic Bus and The Beatles their Yellow Submarine, Saratoga Springs now has its surrealistic tool shed. It will reside here through the summer. The first hint that there was something unusual going on inside the lumber-covered chamber came when Weber initially bypassed it. 'We'll come back to this one,' he announced, walking through the museum as large frames were being hung on walls, small pieces installed and art objects illuminated in preparation for this weekend's exhibition opening. 'It needs about a half hour to warm up,' he reasoned. When we were brought back to The Paradise Institute, it was a quick five steps up onto a platform and then a short walk into the wood box. Once inside, it inexplicably opens up into a massive theater with a wrap-around balcony and resembles a vintage 1920s theater that has gone from vaudeville house to old movie theater, rock 'n' roll palace to modern theatrical stage. It is a little like being on the mast of a ship that was built inside of a bottle. Where you enter the 'theater' is high up in the balcony where there are two rows and 16 seats, each seat fixed with its own pair of headphones. You take your seat, put on the headphones and wait for the entertainment to begin. The headphones use binaural audio recording technology, which means instead of sounds coming at you in two-part stereo, it rushes in waves, coming at you in 360 degrees. Waiting for the film to begin, you can hear the crowd filtering in. There is the rustling of candy wrappers, random conversation, someone coughs. Then the movie begins on the big screen with the introduction of an eerie, tinkling piano. There is a scene with a seductive nurse. There are heroes. There are villains. There is a house on fire. Someone seated next to you whispers secrets in a foreign tongue. Another offers popcorn. Their mundane conversations make it hard to concentrate on the movie on the screen. You want to 'shush' them, but when you turn around, nobody is there. The movie's narrator is in your ear, not describing the movie at all, but instead the role that you're playing in the theater. Just as suddenly, the creepy guy that was in the movie is next to you, whispering in your ear. It trips up the mind by fooling the eyes and tricking the ears, until Weber stands in the light of the doorway when it's all over and says: 'Welcome back.' Thirteen minutes is all it takes. By the time Andy Warhol began messing around with silk-screened Marilyns, Elvises and Liz Taylors, bop and free jazz, and the beat-inflected prose of Kerouac, had already effectively killed the complacent '50s. Coffeehouse poets ditched their black berets and strapped on guitars, and the very young were seduced with the emerging imagery of so-called ''pop'' artists. In 1962, the future was being ushered in on a multi-colored rainbow and, unbeknownst to anyone at the time, the period was encrypted with a series of time-triggered flashes that jarred an oblivious nation and redefined its vocabulary to include extra emphasis on words like acid, assassination, The Beatles and napalm. In the visual arts, Robert Rauschenberg pasted together sheets of paper and drove nails into a flat paint-dripping surface and called it art. His collaborations - like those with choreographer Merce Cunningham, and with composer John Cage - were with artists working in different media. Rauschenberg's friend Jasper Johns was already a featured artist, showing in solo exhibitions - nearly a decade had passed since he started painting his famous flags, and all the buzz was about artists like Oldenberg and Wesselmann, Warhol and Lichtenstein. Popular culture, by way of definition, both reflects and invents society. In the mid-1960s, when musician Lou Reed sang ''I'll be your mirror, reflect what you are, in case you don't know,'' - in Andy Warhol's Factory, no less - he nailed the meaning of ''Pop Art'' head-on. To survive, art needs someone to love it, cherish it, and show it off. For more than 40 years, Ileana Sonnabend has been doing all of the above. A collection of her life's labors have come to the Tang Museum and Art Gallery. ''From Pop to Now: Selections from the Sonnabend Collection,'' is an exhibition of works from the private collection of gallery owners Ileana and her late husband Michael. After Ileana's marriage to art dealer Leo Castelli ended in 1959, Ileana married Michael Sonnabend in 1960. That year, the couple opened their first gallery. Fifty-four different artists and 81 works are part of the Tang exhibition, according to the museum's Director Charles Stainback. 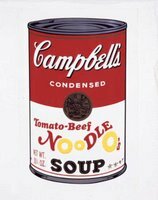 Among the works anticipated to appear are Warhol's 1965 silk-screened acrylic Liz Taylor, soup cans and Brillo boxes, as well as works by Robert Rauschenberg, Claes Oldenberg, Roy Lichtenstein and Jasper Johns. Artists that mix animate and inanimate sculpture, like Jannis Kounellis and poet-turned-performance artist Vito Acconci, will be shown as well. Acconci originally performed one of his earliest - and most notorious - works at the Sonnabend Gallery in 1971. The exhibit covers a period beginning from the mid-20th century to more recent work, such as Rona Pondick's eerie looking ''Dog,'' from 2000. For the Tang, ''Pop'' is a major showing. Charlie Stainback originally had associations with the Sonnabend gallery in the 1980s. The current exhibit was two years in the making, he said. Prior to the opening, I had the opportunity to play the proverbial fly-on-the-wall. In the interest of behind the scenes snooping, I thought it would be neat to share. June 18, 2002: Just a few days earlier, the rooms were vacant and the walls a white-washed void. At this hour, however, the floor space is growing increasingly crowded. Corrugated boxes, neon crates, and construction materials of all shapes, sizes and design are everywhere. Further complicating matters is a seemingly endless stream of incoming deliveries, postmarked from every corner of the Earth. In just a few short days the Tang was to host its opening gala for its grand exhibit of the season, ''From Pop to Now: Selections from the Sonnabend.'' With less than 72 hours to go before the display opened for the big opening, there were still paintings to be hung, exhibitions to be displayed and installations to be, well, installed. The calm in the middle of this firestorm of activity stood a man whom everyone addresses simply as ''Charlie.'' Charlie is Charles A. Stainback, director of the Tang Museum. As the exhibition took shape, he was also the director of all the human activity going on inside the space, as well as the envy of art gallery directors the world over. ''My museum colleagues are amazed,'' he said, one arm hugging an iron pole leading skyward in the Tang's gallery. Higher still, perched on platforms, artists were constructing a full, wall-length Sol LeWitt piece from a sheet of instructions. The amazement stems from Stainback securing the American premier of the exhibit for the Tang. With obvious options like New York City or Los Angeles or Chicago, that the collection has landed in Saratoga Springs first is a significant achievement. Stainback, whose first love is photography, has had an ongoing relationship with the Sonnabends since the 1980s. This particular exhibition was years in the making. Niceties aside, we were simultaneously captivated by one particular crate. From its exterior markings it is apparent that the content of the purple, rectangle-shaped monster is a Warhol. Instantaneously, and out of thin air it seems, two men emerged to begin unraveling the layers of packing material. Finally, the dramatic moment came, and the piece was revealed. The men paused to put on white gloves - the type you usually see reserved for royalty - then proceeded to carefully lift the piece. When the light hit the multi-colored work - a turquoise 1963 piece depicting ''Liz'' Taylor - each fabric of the its brightness reflected a different, and increasingly illuminating layer of the past 40 years of American culture. It was a mind-boggling moment, and it seemed the sound of trumpets should have been heard somewhere. June 21, 2002: A few nights later, the opening took place with much fanfare. The entryways were marked with big silver five-point balloons and a band fills the room with a jazz melody. Somewhere in the neighborhood of 200 invited guests mingled to watch video artists communicate on big screens, inspected Rauschenberg's torn canvas splashes, and Claes Oldenberg's humongous muslin-in-plaster soaked ice cream cone. 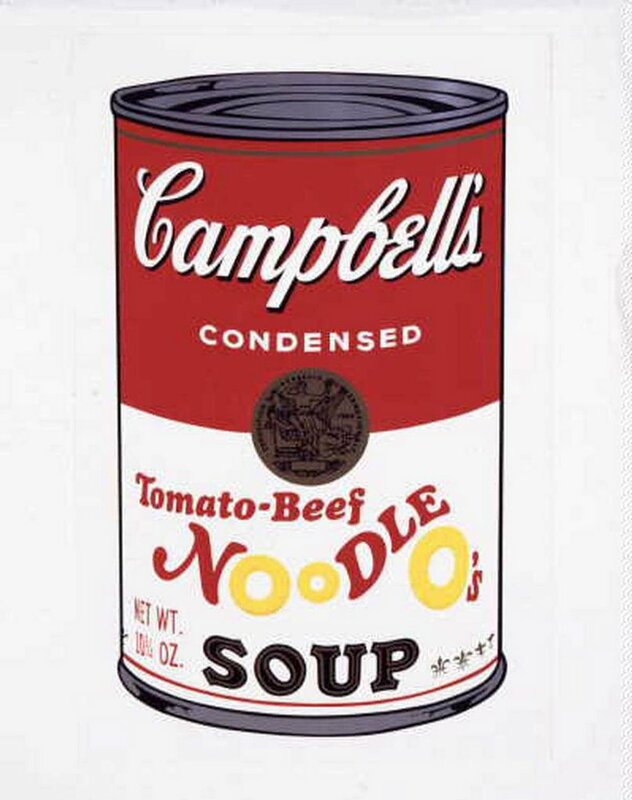 An entire area of the exhibit is reserved for Warhol - Campbell's soup cans, Kellogg's corn flakes, cases of Del Monte peach halves, and red, white and blue Brillo boxes. All the while, artist Roy Lichtenstein's creation - a dark-haired acrylic seductress - stared back with her flirtatious, over-the-bare-shoulder eyes that followed you everywhere. Ileana Sonnabend, whose collection it is, and Oscar Tang (for whose late wife the museum is named) mingled with guests and a number of artists who attended. Jeff Koons posed next to his silver-colored, stainless steel ''Rabbit,'' as Yaddo President Elaina Richardson took in the vastness of it all. ''It's something to come back to see, four or five times, at least'' Richardson said of the visual feast. There are 81 pieces in all. And the first thing you realize is that many of these are real things - every day things - functioning as art. by Thomas Dimopoulos The Saratogian, June, 2002. Ian Berry was standing in a small private room at the Tang Museum filled with Victorian hair wreaths and 16th century oil paintings, vintage shaving kits, old curling irons and wonderfully obsolete hair dryers. Moving through the room, Berry motions to a table displaying small clear bags filled with swatches of hair from the poet Percy Bysshe Shelley and his author-wife Mary. They are dated Dec. 3, 1820. The Tang Museum at Skidmore College is putting the finishing touches on its upcoming exhibition, ‘Hair: Untangling a Social History,’ its curator, Penny Jolly, is also a professor of art history at Skidmore. More than 100 works will be on view, including paintings, prints, photographs and vintage products. The purpose is to explore the meaning of facial, head and body hair in western society, from the Renaissance to the present. More than simple fashion, social and cultural mores have been identified by hair styles and the era in which they were worn - from the powdered wigs of the 18th century French bourgeoisie to the bearded followers of Fidel Castro, whose appearance was in deliberate contrast to the defeated, clean-shaven Cuban army. The cutting and keeping of a lock of hair was common practice during the time of George Washington, especially of friends and relatives in their final days. The clipped hair would serve as a memento of the departed. There were also decorative uses of the finely threaded hair jewelry painstakingly woven with intricate detail into 19th century hair wreaths. The displays at the Tang have come from museums around the country and include a number of contemporary artists alongside vintage works. The earliest piece is a 6-inch by 8-inch oil portrait from the mid-16th century of a young Count d’Angouleme depicted in his wispy goatee and high Elizabethan collar. Another striking portrait displays an 18th century woman with a rising crest above her skull in the shape of a big bow, inspiring visions of early Patti LaBelle. A trio of wigs was brought in for the exhibition from the Smithsonian in Washington, D.C. They belonged to the late Latin music icon Celia Cruz, Harpo Marx and the white-top with orange wings on either side that belonged to Bozo the Clown. ‘That is the one and only - the real thing,’ says Berry. SARATOGA SPRINGS - It could take an entire lifetime - several in fact - for a person to experience the level of artistic beauty, religious significance and human diligence that will be performed in a series of events at Skidmore College this week. Eight Tibetan monks of the Gaden Jangtse Tsawa Khangsten monastery in South India are visiting the Skidmore campus as part of their 2002 North American tour. Their goal is to share awareness of Buddhist traditions and gather funds for the completion of their prayer hall in Mundgod, India. One of the focal points of the monks’ visit is construction of a sand mandala at the Tang Teaching Museum and Gallery. The “mandala” - a translated sanskrit word meaning “center and periphery” - is a circular design, incorporating geometric shapes and images of deities and cosmic forces in a symbolic universe. This Manjushri mandala (“He who is Noble and Gentle”) will be ritualistically constructed with the detailed laying of sand, grain by grain, using thin copper funnels, or sprinkled with the fingers. The sand mandala will take four days to create, after which it will be ceremoniously destroyed and returned to the earth at Skidmore’s Haupt Pond. The monks’ four-day residency at Skidmore features lectures, performances of ritual ceremonies and demonstrations of mystical arts. Joel Smith, associate professor of philosophy, is introducing Wednesday’s lecture. “We hope that it is educational for students as well as for the general public,” said Smith, who is also chairman of ASIA Network’s board of directors. “It (the mandala) is also a work of art, one in which people can appreciate beauty, religious meaning and a way of becoming more aware of those people in exile,” he said. Life in exile has been a major part of Tibetan life since 1959. The monks’ original home was built on a vast piece of Tibetan mountainside near Lhasa in 1409 and housed as many as 6,000 monks at a time. But in 1959, Tibet was overtaken by the invading Communist Chinese Army and most of the monasteries were ransacked. Ancient scriptures were burned, many Tibetans were killed and their monasteries destroyed. The few hundred monks who escaped fled to South India and began rebuilding. Today, the Gaden Jangtse Monastery is home to 1,400 monks between the ages of 6 and 80. A new prayer hall is under construction. More than 10,000 nuns and monks attended the consecration ceremonies in December, performed by His Holiness The Fourteenth Dalai Lama. This touring group of eight monks was chosen specifically for their talents in the ritual arts. The group is composed of a Head Lama, a Tibetan medicine doctor, and masters of dance, chant, ritual, music, mandala and painting. A translator is on hand to provide interaction with the public. The monks are staying at Falstaff’s on the Skidmore campus for the duration of the week. They may be seen walking to and from the Tang Gallery during construction of the mandala. The sand mandala may be seen in the early stages of construction. A demonstration of butter sculpture - generally made using yak butter, or a vegetable butter called “ghee,” fat and wax - has been arranged and will be part of the festivities. The project and its programs are free and open to the public. On Thursday morning, the completed sand mandala will be destroyed during a ceremony at The Tang from 9 to 11 a.m. after which it will be returned to the earth. SARATOGA SPRINGS - The banners were hung on Broadway Thursday night - draped across the brick façade of Borders bookstore and lighting up the street like it was opening night at The Met. They depicted large posters with giant images of stained glass, a lonely steeple, and orb-shaped windows, introduce the latest project of photographer Emma Dodge Hanson. Hanson, whose focus has included pop stars and fashion models for international magazines, has turned her attentions to a local subject in 'Images of a Landmark,' documenting the ongoing restoration of the historic Universal Preservation Hall on Washington Street. 'I've been photographing it for a year and a half now, inside and out,' says Hanson of her black-and-white images documenting the massive restructuring of the UPH. Her images capture the historic hall, its twisted shanks of wounded architecture stained by time. Depicted, as well, is the vastness of the sacred space, and the progress of its restoration that will continue through 2005. When complete, the historic hall dating back to the 1870s will feature a rare collaboration of a worship space for the Universal Baptist congregation and a 750-seat performing arts theater for the city. Hanson's is a visual diary of the transformation. 'Some are abstract (in style), others are larger, more panoramic,' says Hanson of the series of 11 x 14-inch images on exhibition. There are 18 shots in all, which also signify a change in the style of Hanson's art. Hanson grew up in Nantucket, R.I., watching her grandmother, who stood behind the lens of a camera, capturing the images of children for a series of books published by Random House. Hanson studied photography at Skidmore College and published her first book of photographs in 1998 - 'Solo: Women Singer-Songwriters in their own words.' The book includes more than 150 photographs of musicians, from a winsome looking Jewel to the playful Ani DiFranco, wearing a leather jacket and a baseball cap, to the seriously determined pose of Sheryl Crow. Hanson's other work has included sessions with authors like Joyce Carol Oates and Russell Banks, still photography for dance companies, the white-gowned and tuxedoed couples captured in matrimonial bliss that have appeared in national bridal magazines and, as she watched her grandmother do, she has captured images of children in their starry eyed stages of awe and wonder. In each, the focus is on people going about their daily lives. With 'Images of a Landmark,' Hanson is working for the first time on architecture, capturing camera angles with arches and bell towers and sleek, sassy balconies where curvaceous lines seem to go on forever. Four frames depict the building's façade, each connected to the next. When they are hung side by side, their collaboration is not unlike a musical quartet brought together to create a new world symphony. While the work concentrates on the architecture, three pieces in particular - 'Pews,' 'Electrical Insulators,' and 'Hanging Lights' - depict objects grouped together like bands of families, a human gathering of inanimate objects. The building itself, with its asymmetrical roofline and mix of Italianate and Germanic gothic-style architecture, provides an intriguing visual base. Hanson's images capture both its historical meaning and its importance for the future, as it undergoes its transformation. Inside the UPH, Shane Williams-Ness walks through the classic walnut and ash doors that lead up the stairs and open up into the big, beautiful space that will be used for a performing arts center. 'One of the goals is to maintain and enhance the already fabulous acoustics,' says Williams-Ness in the room with towering interior ceilings. Along its flanks, six stained glass windows line each side of the massive hall, while a crew works on the dismantling and rebuilding. A goal, according to Williams-Ness, is to make it a comfortable place to sit and enjoy everything from jazz and pop performances to choruses and modern dance, when the space opens sometime in 2005-2006. Between now and then, Hanson will continue to document the evolution of the space, depicting a rebirth of sorts, a diary for Saratoga's children and their children's children to revisit in the future.